This Nikki Lissoni Yellow Gold Vintage Perfection Coin 33mm features a sparkling vintage design. This is embellished with Cubic Zirconia stones to give the coin an extra sparkle. The intricate detailing of this coin makes it stand out in your chosen Nikki Lissoni carrier. This coin would be the perfect gift for her, making a necklace more personal to her. Ref: Make a statement with the Nikki Lissoni collection. From Nikki Lissoni is this Silver and Pink Mirror Coin 23mm. Pair this coin with a small Nikki Lissoni carrier and a stunning Nikki Lissoni chain, for the perfect necklace. This Nikki Lissoni Silver and Pink Mirror Coin 23mm features a square design in the centre of the coin. 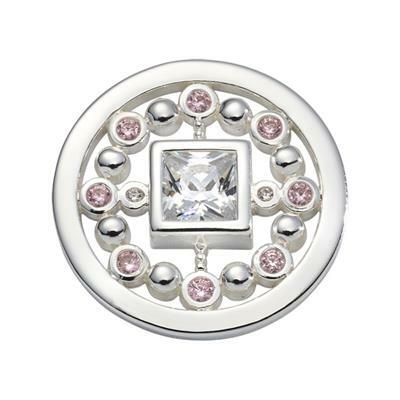 This coin is embellished with White and Pink Cubic Zirconia stones to give the coin an extra sparkle. Surrounding the square feature, is a cut out design of stones which is lining the inside of the coin. The intricate detailing of this coin makes it stand out in your chosen Nikki Lissoni carrier. This coin would be the perfect gift for her, making a necklace more personal to her. This coin is crafted from 925 Sterling Silver.